Applications are invited for a UCD Research Fellow in the UCD School of Chemical and Bioprocess Engineering. This is a temporary post. Energy is a strategic institutional priority for UCD, manifest most obviously by the establishment of UCD’s Energy Institute, which brings together Individuals and Schools from across the University to Collaborate their research efforts on the multifaceted area which is Energy Systems. Energy systems have evolved over decades from individual energy devices and small sub- systems into a complex set of systems, both physical, institutional and at all scales. The Energy Systems Integration Partnership Programme (ESIPP) is a co-funded research project of €11m between Science Foundation Ireland, industry and philanthropic donation, which aims to further strengthen industry research links and to facilitate maximum societal impact. The successful applicant will contribute specifically to ESIPP’s Modelling Strand and it is expected that research findings and outputs will be published in leading international peer-reviewed journals. The candidate should have a background in modelling and optimisation, applied to energy systems with a strong knowledge of fundamental engineering principles that are driving the integrated energy system of the future. The ESRI hosted a symposium on Risks in Integrated Energy Systems which took place on 6th March. The aim of this half-day symposium was to bring academia and industry together and discuss theoretical and practical issues of risks and finance in integrated energy systems. There was a great turnout for this event - thanks to all who attended. The slides are now available on the ESRI Website. The aim of this half-day symposium is to bring academia and industry together and discuss theoretical and practical issues of risks and finance in integrated energy systems. Energy system integration (ESI) is the process of coordinating the operation and planning of energy systems across multiple pathways and geographical scales in order to deliver reliable, cost effective energy services with less impact on the environment. With the ongoing energy transition questions arise about what types of risks and uncertainties do market participants of integrated energy systems face and how can they manage them. These risks include price dynamics in fuel and carbon markets, declining costs of competing technologies, and uncertainties related to consumer demand and energy policy. For further information please see the ESRI Website. Registration: There is no fee for this event but please register your attendance HERE. 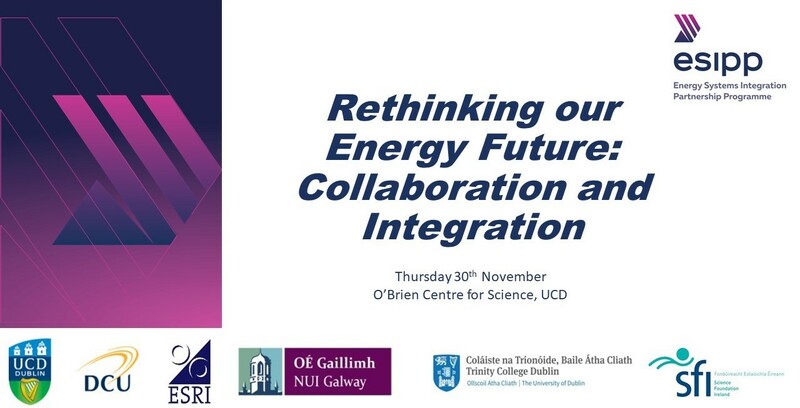 The presentations and posters from the ESIPP Research Symposium "Rethinking our Energy Future: Collaboration and Integration" which took place on Thursday 30th November in UCD are now available on the event page on our website. The programme is now available for the ESIPP Symposium - Rethinking our Energy Future: Collaboration and Integration.